53 years ago, Martin Luther King Jr. gave one of the most famous and influential speeches in American history. The “I Have a Dream” speech was effective not just for its words, but also for Dr. King’s impassioned delivery. It represented the feelings of millions of people fighting for civil liberties. The speech, given by a lesser man in a lesser setting may not have earned the same attention. Dr. King knew if he were to truly help bring about change, he would need a speech and setting that would inspire. The March on Washington and “I Have a Dream” speech caught the attention of a nation, and brought it closer to the much-needed change. 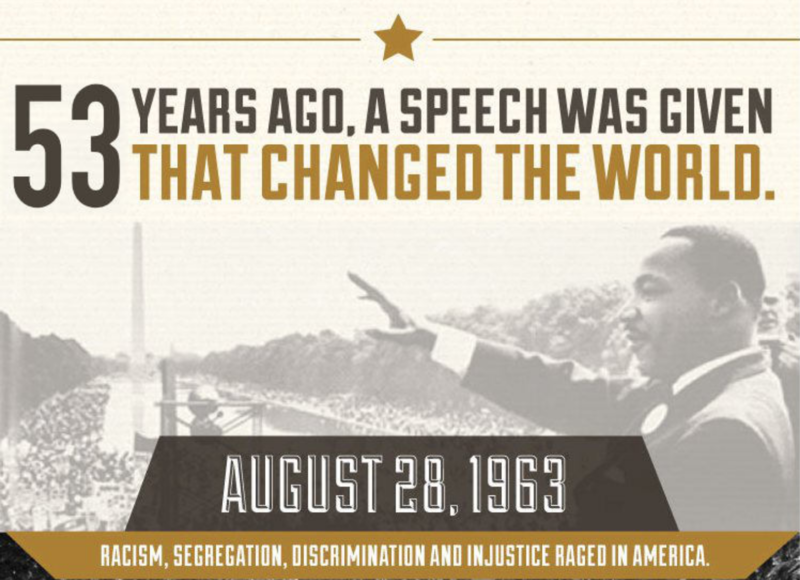 eSpeakers believes in the power of great speeches like the “I Have a Dream” speech, and in great speakers like Dr. Martin Luther King, Jr. To honor his speech given 50 years ago, eSpeakers has created an infographic in commemoration of that great moment in American history. You can view the infographic below. To find great and inspiring speakers for your own event, consider searching eSpeakers Marketplace. What's the difference between eSpeakers and Gigmasters?